In order to prepare a sculpture commission proposal and a quote, I prefer to do an initial consultation with the clients and do a site visit to discuss the requirements, site conditions, materials, budget and timeline. When creating any sculpture for a client it is important to know what type of sculpture inspires them. 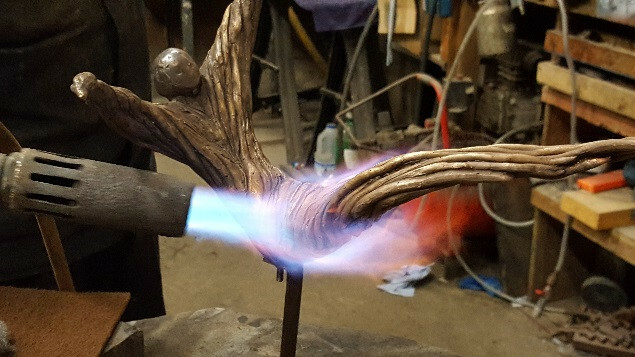 I like to find out what elements of my sculptural work appeals to them, so that I can create a truly special sculpture to compliment their individual style. If you are interested in discussing the possibilities of commissioning a sculpture or to see what is already available, just send me an email and we can discuss options. The following are elements you may need to consider before the initial consultation, to help me get a sense of what may work best. - What approximate measurements you would like your sculpture to be, while also taking into account the mesurements of the access route for installion on the sculpture. - Attach images of other sculptures and materials that you like. After the initial consultation, a proposal is presented with proposed costs, materials, time lines, delivery and installation details. After the proposed sculpture is agreed upon, the sculpture is paid in installments, with the 1st stage paid before work can commence and is non refundable. The second stage is paid when the sculpture fabrication is complete and the final payment is due when the sculpture is delivered and installed. I am happy to combine the initial consultation and site visit. This stage is billed at an hourly rate. Trips beyond a 25km radius of Drogheda will incur a fee to cover travel costs. This consultation stage is billed prior and seperate to the fee for the creation of the sculpture. As the artist, I retain all copyright of the commissioned work(s) and it may not be reproduced or used for commercial purposes without my permission.